Theaster Gates is an American social practice installation artist and a professor in the Department of Visual Arts at the University of Chicago. He is the founder and artist Director of the Rebuild Foundation, a non-profit organization focused on cultural-driven redevelopment and affordable space initiatives in under-resourced communities. For the Dorchester Projects, one of Rebuild's Foundation's most celebrated works, a group of once abandoned buildings on Chicago’s South Side were renovated from what appeared to be sites of neglect, into lively cultural environments where the community gathered. The Dorchester Projects sought to explore branding for the overarching and ongoing work while also introducing Dorchester Industries. The two were to live like mother and daughter. Dorchester Industries might have a product or material that lives inside a Dorchester Projects space. A concentration on the space and material came to focus after the discovery phase and collaboration with Theaster Gates. During the discovery phase I was able to visit and photograph a handful of the spaces and meet many of the people working on various projects. One overwhelming sentiment was that things are always influx—projects are shifting, evolving, ending, beginning—pieces are always moving. I want to embrace this fluidity in the identity design. I think Dorchester could benefit greatly from a variable logo system. By creating a visual language, the brand can take on different ideas and themes. Similar to a constellation, this language is a group or cluster of related things, but no two are quite the same. However, we read them as part of the same language and associate them as parts of a whole. 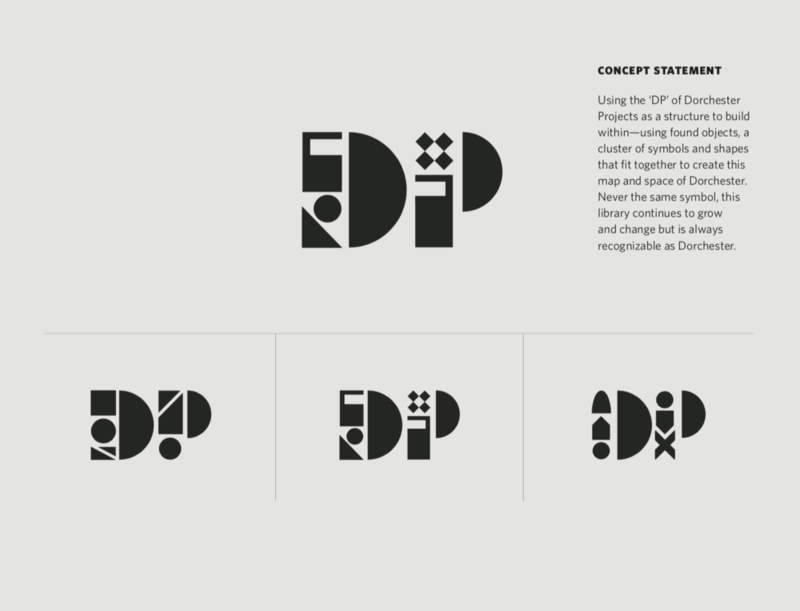 Concept Statement: Establishing a network for ambition, curiosity, and a flourishing culture—here taking the Dorchester ‘D’ and incorporating a ‘P’ within it, using lines to connect and create a network. Within this mark we can begin to incorporate related symbols of space and material. Creating a visual library that can develop over time and take on different themes for various projects. These marks incorporate different design elements and ideas used throughout the spaces and house them within the pathways of the Dorchester ‘D’. Concept Statement: This symbol—as found on the entry door to the Stony Island Arts Bank—but simplified here, representing land and space at its most simple iteration, but going on to introduce culture, material, and community through its visual language. Concept Statement: Using the ‘DP’ of Dorchester Projects as a structure to build within—using found objects, a cluster of symbols and shapes that fit together to create this map and space of Dorchester. Never the same symbol, this library continues to grow and change but is always recognizable as Dorchester. Following the exploration it was made clear that the brand was looking for a typography based treatment, so further exploration began while still thinking of incorporating icons. Remora Sans was chosen and typeset for the brand and further brand lockups, product labels, colorway, printed materials, and icons were developed.